The Sioux Indian Museum, administered by the U.S. Department of the Interior, Indian Arts and Crafts Board, features a new exhibit by Mark Little Elk. The exhibition will run from November 2, 2018, through January 14, 2019 and is free and open to the public. Mark Little Elk, an enrolled member of the Rosebud Sioux Tribe, is a skilled draughtsman and painter. He currently resides in Rosebud, South Dakota, where he works full-time as a professional artist. Mark draws on his own life experiences and dreams to produce ideas for his work. 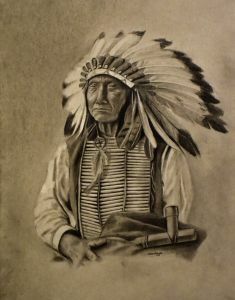 His lifelike drawings of historical figures such as Sitting Bull and Crazy Horse show incredible realism and attention to detail. Through the use of historic photos as references, Mark ensures that his drawings capture the spirit and character of these iconic individuals. Having overcome personal tragedy in his own life, Mark hopes that his art can provide a positive message and a beacon of hope for others who are facing difficult challenges. This is the first exhibition of Mark Little Elk’s artwork in a museum or gallery setting. Prices for the artwork can be obtained by contacting The Journey Museum Store at (605) 394-2201. To purchase artwork after the exhibit closes, please contact Mark Little Elk at marklittleelk@gmail.com.